Delray Awning, Inc. - Your local custom awning manufacturer. 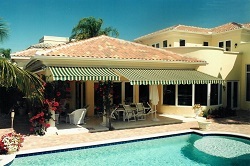 Builders of custom awnings, patio covers, carports, cabanas & shades. Proudly serving residential and commercial clients in Florida since 1959. 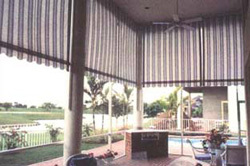 Delray Awning has been producing quality custom fabric awnings for over 55 years under the Day family ownership. We have committed ourselves to an on-going tradition of superior workmanship and customer service. We have the design and application experience in-house to satisfy your specialized fabric awning needs. Call us Monday-Friday between 8:00 am and 4:00 pm to schedule an appointment to receive a free estimate - 561-276-5381. Delray Awning combines quality materials and experienced craftsmanship to give you the perfect blend of beauty, fashion and function. We have received achievement awards in residential, commercial and specialty categories from the awning association industry. We also belong to the (IFAI) Industrial Fabric Association International and (PAMA) Professional Awning Manufacturers Association. We service all City's within the Palm Beach County & Broward County area. 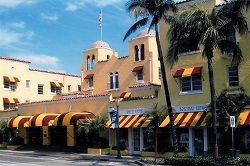 "The new awnings are a great success & everyone is pleased. The gentlemen who installed the awnings did an excellent job. They were courteous and worked continually in the heat, not even taking a break for lunch. They deserve a thank you for a job well done." "My partner and I were extremely impressed with the professionalism of your workers that installed the awnings at our residence yesterday. They were on time, courteous, and when finished up they cleaned the area thoroughly... The end product was much more than we expected. Thanks again for the pleasant experience in doing business with you and we will definitely recommend you to our associates and clients." "This is just a note to say, "Thanks". You did a terrific job on both the awning and mail box cover. Everyone was professional, neat and courteous. It was a pleasure to have you as one of our vendors. Thanks again." Call To Setup An Appointment, Free Quotes!